There’s nothing more exciting than starting a side hustle. Life isn’t easy and everyone is fighting for the same things including leftover scraps. In a dog eat dog world, we all want to be the biggest dog in town if not the world. The ones who are the biggest dogs are killing it and enjoying the good life. They’re the ones putting others to work while they take it easy, sit back and relax and enjoy the fruits of their labour. You certainly want to be in that same position as would I. Who wants to be working for someone else for years and years? And even then, financially there’s not a whole lot of extra money coming in despite getting promotions in our place of employment. If you want to make the real money, you need to be in charge. You need to be the boss, the leader, the business owner. 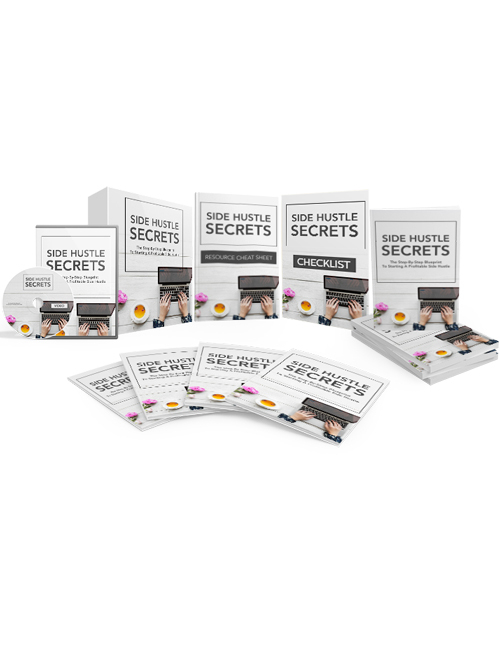 In this extensive video course which is a supplement to the Side Hustle Secrets Ebook, you’re going to discover the best marketing strategies for your side business, how to adopt the right mindset, knowing when the time is right to quit your job, prioritizing and managing your time, devising the right blueprints and strategies to ensure your success, finding the right niche and much more. You’ll also learn how to identify your best skills, create multiple streams of income, build your brand and all the while staying focused and motivated. This is a life changing course that you definitely want to get a hold of. Hit the download button now.